The new menu selection on-board Air Transat will have your clients feeling as though they’re sitting down at Chef Daniel Vézina's restaurant in the Old Port of Quebec City. At a tasty launch party in Toronto, TS revealed that starting 1DEC, it will offer a new seasonal Chef’s Menu with eight meal options created by Vézina. The main courses include a pulled-beef shepherd’s pie that was unlike any other I've tasted. Each bite was full of beautifully cooked beef, leek purée and goat cheese. More mouth-watering menu options include a salmon filet with Asian noodles, turkey with cranberry sauce and butternut squash risotto, white bean and quinoa bowl, cheese and tomato orzo risotto, and braised beef bourguignon. 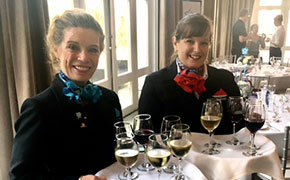 The Chef’s Menu is complementary for Club Class pax, but economy flyers can order these three-course meals for $25 – including a glass of wine, cheese plate and dessert. It’s wise for them to use the pre-order option to ensure they get the meal they desire. 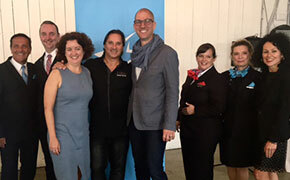 The event was well attended and accompanied by Air Transat inflight team members serving the new menu, which includes options for various dietary needs and preferences. Transat VP National Sales Denise Heffron revealed that the first time she tried the menu onboard, she asked to try her neighbour’s meal as well because it smelled so good. Her seatmate had to ask for it back as Heffron’s fork was poised to go back for more. 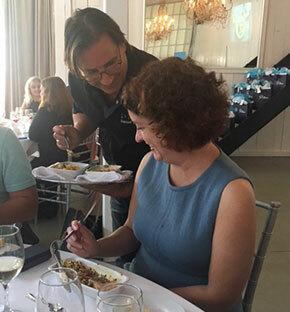 Chef Vézina was involved throughout the event, making sure to put his final touches on meals before they were served. 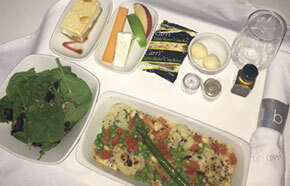 He explained that he had tested the flavours of the new menu at 30,000 ft. to ensure the quality of taste. 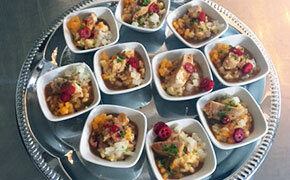 It certainly tasted wonderful on the ground, and should make for some very happy Air Transat customers in the air.